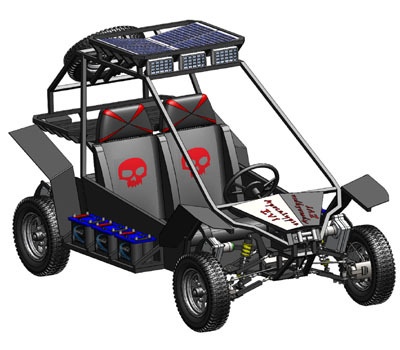 Solar Powered Vehicle For the Zombie Apocalypse – ApocalypsEV | We Zombie! Energy Matters has posted an article about a solar powered zombie apocalypse vehicle, perfect for the day when those Hummers are out of gas and are only useful for a temporary blockade or shelter. The ApocalypsEV includes a 5 point harness and roll cage, and a deluxe model will have a lockable trunk, perfect for storing survival items which you’ve looted (borrowed) from abandoned stores. Two brothers, Michael and Kenny Ham, are building the affordable street-legal electric vehicles that are apocalypse ready, and they promise not to sell them to the undead. This entry was posted in News/Events, Products. Bookmark the permalink.